Polygonum perfoliatum. © Leslie J. Mehrhoff.U. Conn. Bugwood. 2008, the Bugwood. Center for Invasive Species and Ecosystem Health at the University of Georgia org.nyis.info (Accessed 7/2014). Polygonum perfoliatum is an annual vine, from shallow, fibrous roots, stems with backward-pointing spines, (like tearthumb species), growing to 7 m in a season, can grow about 15 cm per day (Mitchell 1995), stem often becoming woody, climbing over other vegetation, forming dense mats; sheath at base of leaf stalk expanded to form a circular, leaf-like collar surrounding stem (perfoliate). Leaves alternate, leaf stalk spiny, longer than leaf blade, attached to lower surface (peltate), blade to 8 cm long, about as wide, triangular to arrow-shaped, waxy, pale green, margins rough, thin, veins palmate at base. Flowers small, greenish to yellowish, 0.5 cm, in spike-like racemes to 2 cm long, few-flowered. Fruit becoming fleshy from enlarged sepals, iridescent-blue, berry-like, sweet, attractive to birds, 1-seeded; Sept.-Nov.; prickly dead vines bearing fruit may persist into winter; achenes 0.3 cm, black, shiny rounded; overwintering as seed, germinating in April (Uva et al. 1997). Frequency in NYC: Not reported from NYC as of 2005. 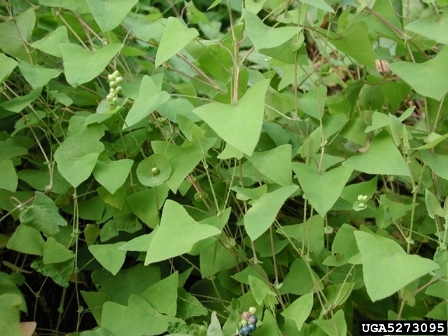 Highly invasive, spreading from Maryland and Pennsylvania to New York State. Origin: East Asia. Prefers open, moist, well-drained soil, fairly shade tolerant.